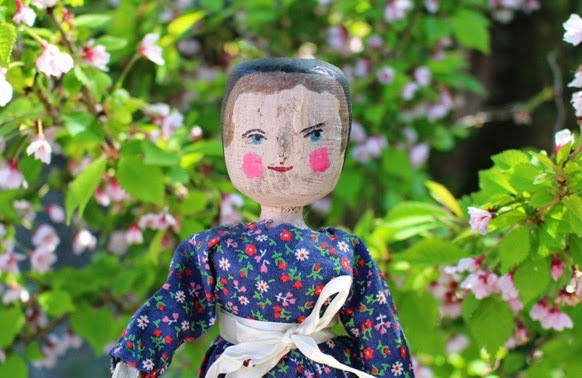 Allow me to introduce Jessie - the latest edition to our growing collection of antique wooden peg dolls. 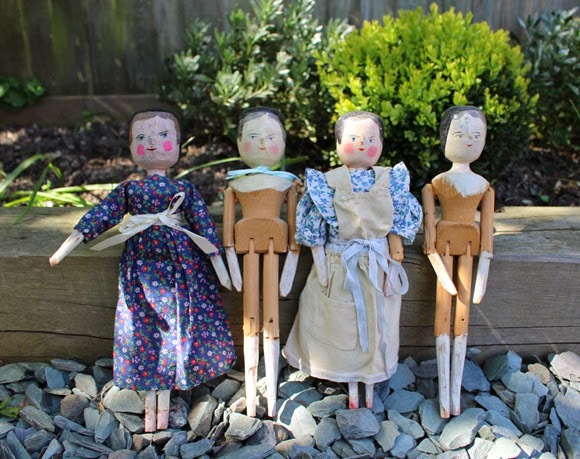 Having traveled from America, she joins Emily, Lily and Pinny and takes our collection up to four dolls. Someone in Jessie's past obviously decided she needed a make-over and set about her with some paint (neon cheeks anyone? ), meaning her features are rather bright in colour compared to the other dolls in the collection - although not ideal, the paint-job merely adds to her unique story. It actually reminds me of the story of the little old lady in Spain who decided to zjoosh-up a priceless 19th century fresco of Jesus (you've got to laugh...). Jessie came in a simple, blue floral dress tied around the waist with a cream bow. 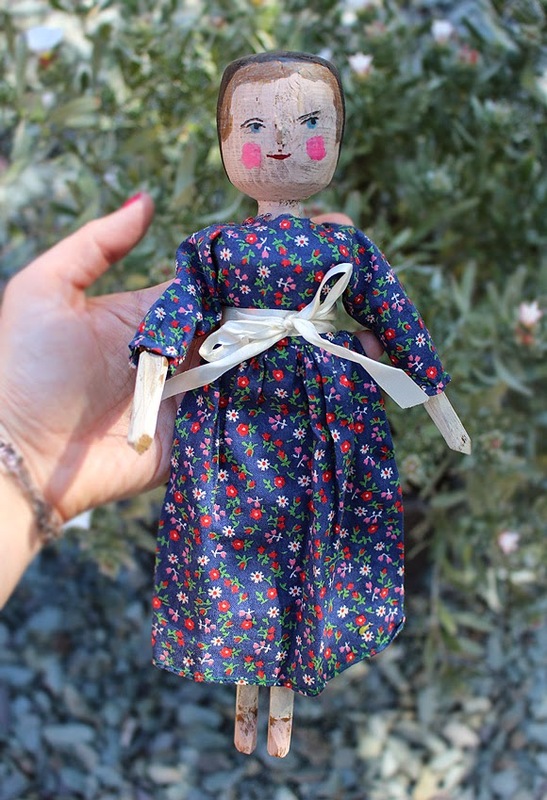 Of all the dolls we have, her limbs move most freely. I can't help but wonder if there's been some handy work done on them too - but I daren't remove her dress to look! Note: Jessie's face and limbs have been painted with pale pink by someone in her past. Note: She wears a simple blue floral dress tied with a cream bow. Our collection: Jessie, Lily, Emily and Pinny. 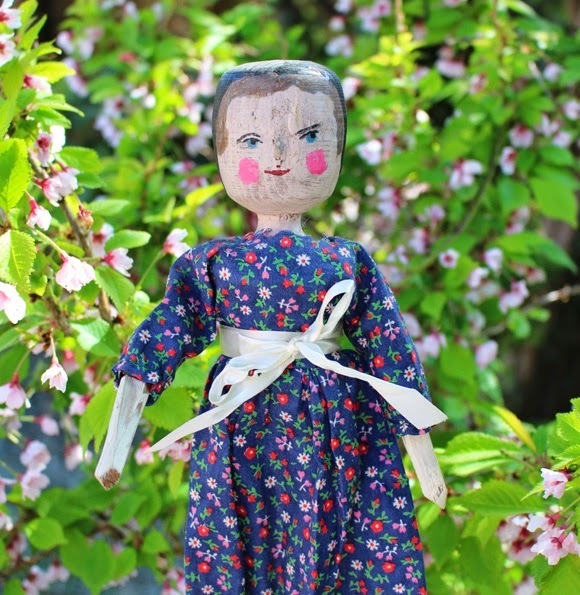 COMING SOON: All about Peg-Doll Lily and more about Pinny's House!